When Morgan was first diagnosed with autism, my husband and I were in "fix it" mode. We meant that our end game was that Morgan would be indistinguishable from other children. We wanted him to pass for typical. We wanted him to be happy at all costs, as long as those costs were within our scope of reasoning. I didn't care that the little voice in the back of my mind screamed this approach was wrong for us. Nope, it didn't matter. My son's voice and the atypical way he spoke? That needed to change. I completely neglected to remember that I should be thankful to be hearing words, finally. Those fidgeting and flapping fingers? Those needed to stop. All of the books said so. Typical kids don't do that. Scores needed to climb higher. He needed to blend with the other children. He was miserable, so were we. The more I pushed for him to be less of an individual and part of a herd, the more behaviors we saw. I (I say "I" because my husband traveled a lot in those days and I was the primary caretaker) wasted time and energy. I didn't see that this wonderful boy who had been in front of me the entire time was great, just the way he was. He needed support, not to be changed. The only changes that needed to be made were the parenting and teaching methods being applied to him. I don't remember when the epiphany occurred, but when it did, breathing became a bit easier. Morgan began to smile more. We, as a family, enjoyed life more. We understood each other better. 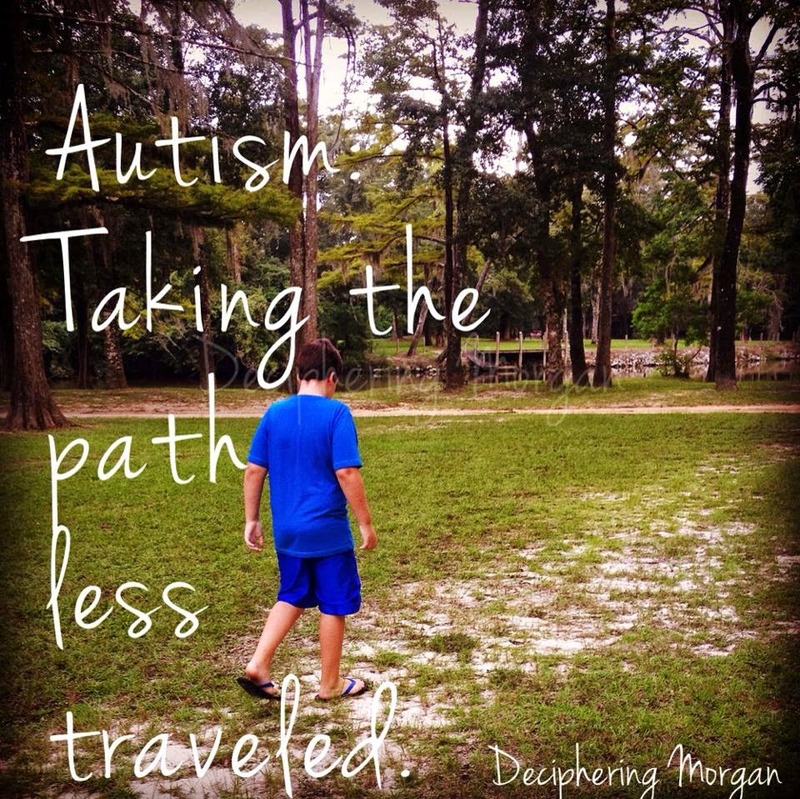 There was no more suppression of autism, there was only expression of Morgan's truest self. Sometimes his truest self wasn't the happiest child or the nicest, but he's been himself and not some representation of what I wanted him to pass for. This begins with allowing him to stim and extends to indulging him in his love of Thomas the Tank Engine at the age of ten- we used to fight against those things. He is in what is considered middle school here and with it comes clubs, a dance or two, and some pressure to fit in. Morgan doesn't really feel that pressure, I think, but he misses having friends. A teacher, when I was chatting with her, offered up some suggestions that would, in a sense, eventually allow Morgan to "fit in and pass" as a typical child. I laughed. I told her that "being typical" isn't possible and therefore, isn't on our radar. I don't want my son to pass for something that he is not. Morgan is the most genuine person I know and I want him to stay that way for as long as possible. I don't believe that teaching him to mask his personality, his thinking, his mannerisms, or his truest self, is the best way to go about things. The teacher saw my points and agreed. I can't wash my son typical. I don't want to. I don't want to compare him to his typically developing peers and feel sad or long for something we've never had. I don't want to push him to be something that he's not. Instead, I would rather push him to be the best that he can be. The less I've pushed Morgan to "pass," the more I've allowed him to play with his autistic peers, typical peers who get him, and just "be," the happier he's been. That's the end game for me, right now. Happy. I understand why, out of ignorance, I wanted my son to assimilate and "become typical." I thought that, with enough hard work and diligence, he could figure out how to be typical and happy. My very literal brain was taught by society that my son would never be happy so long as he was autistic. That he could never be happy as an autistic. I'm so glad that I stopped listening to what I was told. Society is wrong. Being atypical is not easy. Being autistic is not easy. But you can be happy. It just takes the right environment. I echo maternalinstincts comment---this speaks to my heart and soul today. Thank you for sharing. I literally just had a meeting with the school home therapist, where I told her I don't care about making him not be him, I just want to teach him better communication and safety skills. And he can be the same awesome kid he always has been, twirly haired, noisy, and strangely perfect, as long as he grows up knowing we never wanted to change him, only help him. Bravo girl. This is excellent.